Walking into the inaugural Cherry Hill Junior Police Academy last Monday morning, none of the 30 junior cadets knew what to expect. Sgt. Keith Mahan, a Cherry Hill police officer who has worked in police academies for more than a decade, ran through drill and ceremony with the middle school-aged kids. Later, Mahan and other officers led the kids outside for some physical training under the hot summer sun. This was just the beginning of the weeklong academy, a week many of the cadets would not forget. A few hours into the first day of the academy, Jacob was no longer nervous. He was socializing with his fellow cadets and the officers in the Cherry Hill Police Department. He quickly realized while there is a lot of work involved with being a police officer, it’s very interesting. Jenkins said he didn’t know what to make of things when the cadets were ordered to lineup and march for the first time last Monday. As the day went on, however, he really enjoyed interacting with the officers. Mary Gray, 13, found interacting with the officers to be one of the best parts of the entire week. “They are very friendly, but they are also strict at some times, which is good,” she said. Despite having more than a decade of experience in police academies, last week was the first time Mahan had ever gone through drill and ceremony and physical training with kids. Even though the cadets aren’t in the actual police academy, the junior academy was structured to operate in a very similar way. “It’s scaled down for kids their age, but in terms of the academic program and the physical program, they get the same training in a modified form than any other officer would get,” Mahan said. Mahan said it took a little bit for the kids to pick everything up the first day. However, he said the cadets were very responsive, energetic and willing to do whatever task was brought before them. Last Tuesday, the cadets took a field trip to the Juvenile Detention Center in Blackwood for one of the more impactful experiences of the week. 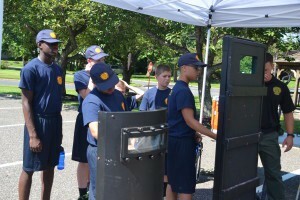 The cadets learned about other kids their age who were in custody at the center and realized the seriousness of various crimes. The trip to the detention center came with a message. The academy was not just to show the cadets how police operate on a daily basis, but also to show them the consequences others face for not following the law. A number of cadets felt the lesson learned at the center was one of the most important parts of the week. “The Juvenile Detention Center puts in perspective what could happen if you do something wrong,” Mary said. There are many departments and areas within Cherry Hill Police. 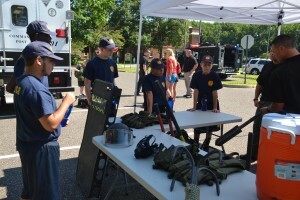 From the K-9 unit to tactical response teams to the police department’s command center, the cadets got a sneak peak at nearly every aspect of the police department. Each cadet had his or her own favorite part of the week. Jacob enjoyed climbing and checking out some of the police’s specialty vehicles. 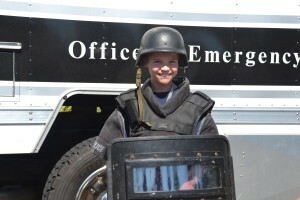 “Today, I really enjoyed the armored vehicle and looking inside of it,” he said. Standing at a tent set up in the parking lot of the police department, Jenkins couldn’t keep his eyes off the many tools, vests, shields, weapons and other items the police use on a daily basis. “This is amazing just looking at everything,” he said. In a field across from the police department, Mary was most captivated with the police department’s’ four K9 units. She found their work the most interesting part of the week. “I think it’s really cool how the dogs can find drugs and other stuff,” she said. The academy might have had the biggest impact on Mary. While she found the drill and ceremony and physical training tough on the first day, she said the entire experience is helping to point her in a potential career path. “I think I would want to be a police officer,” she said. Upon hearing Mary’s statement, a smile spread across Mahan’s face. Seeing the impact the program had on the cadets was the most rewarding thing for him.